Method for Efficiency Increasing of Distributed Classification of the Images based on the Proactive Parallel Computing Approach, MUKHIN, V., VOLOKYTA, A., HERIATOVYCH, Y., REHIDA, P.
Wind Speed Prediction with Wavelet Time Series Based on Lorenz Disturbance, ZHANG, Y., WANG, P., CHENG, P., LEI, S.
SKOBERNE, N. , CIGLARIC, M.
It is often suggested that the approach to IPv6 transition is dual-stack deployment; however, it is not feasible in certain environments. As Network Address Translation -- Protocol Translation (NAT-PT) has been deprecated, stateful NAT64 and DNS64 RFCs have been published, supporting only IPv6-to-IPv4 translation scenario. Now the question of usability in the real world arises. In this paper, we systematically test a number of widely used application-layer network protocols to find out how well they traverse Ecdysis, the first open source stateful NAT64 and DNS64 implementation. We practically evaluated 18 popular protocols, among them HTTP, RDP, MSNP, and IMAP, and discuss the shortcomings of such translations that might not be apparent at first sight. H. Afifi and Laurent Toutain, "Methods for IPv4-IPv6 Transition", in Proc. IEEE Symposium on Computers and Communications, Sharm El Sheik, 1999, pp. 478-484. M. Tatipamula, P. Grossetete and H. Esaki, "IPv6 Integration and Coexistence Strategies for Next-Generation Networks", IEEE Communications Magazine, vol. 42, pp. 88-96, Jan. 2004. D. G. Waddington and F. Chang, "Realizing the Transition to IPv6", IEEE Communications Magazine, vol. 40, pp. 138-148, Jun. 2002. D. Wing, "Network Address Translation: Extending the Internet Address Space", IEEE Internet Computing, vol. 14, pp. 66-70, Jul. 2010. O. Martin, "Where is the Internet heading to? ", Journal of Physics: Conference Series, vol. 219, part 6, 2010. R. AlJa'afreh, J. Mellor and I. Awan, "Implementation of IPv4/IPv6 BDMS Translation Mechanism", in Proc. UKSIM European Symposium on Computer Modeling and Simulation, Liverpool, 2008, pp. 512-517. 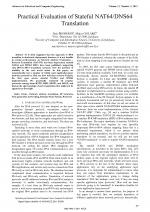 R. AlJa'afreh, J. Mellor and I. Awan, "Evaluating BDMS and DSTM Transition Mechanisms", in Proc. UKSIM European Symposium on Computer Modeling and Simulation, Liverpool, 2008, pp. 488-493. R. AlJa'afreh, J. Mellor and I. Awan, "A Comparison Between the Tunneling Process and Mapping Schemes for IPv4/IPv6 Transition", in Proc. International Conference on Advanced Information Networking and Applications, Bradford, 2009, pp. 601-606. J. Davies, "TCP/IP Fundamentals for Microsoft Windows", Microsoft Corporation, Feb. 2008. 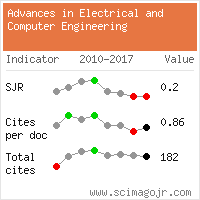 Citations for references updated on 2019-04-21 20:22 in 64 seconds. Website conception, design and maintenance by Eugen COCA. Content updated on 28 Feb 2019. Site engine updated on 28 Feb 2019. This page was generated on the server in 0.097 seconds and loaded in your browser in > seconds.